Your employer has the responsibility to provide a safe workplace. Employers must follow all OSHA safety and health standards to prevent you from being injured or becoming ill on the job. If you are under age 18, there may be limits on the hours you work, the jobs you do and the equipment you use. Learn about the federal and state wage and hour child labor laws that apply to you. Provide training about workplace hazards and required safety gear. (Employers must pay for most types of safety gear). Tell you where to get answers to your safety or health questions. Tell you what to do if you get hurt on the job. Report unsafe conditions to a shift/team leader or supervisor. Wear any safety gear required to do your job. Work in a safe place. Receive safety and health training in any language that you understand. Ask questions if you don’t understand instructions or if something seems unsafe. Use and be trained on required safety gear, such as hard hats, goggles and ear plugs. Exercise your workplace safety rights without retaliation or discrimination. File a confidential complaint with OSHA if you believe there is a serious hazard or that your employer is not following OSHA standards. We Fight for Victims of Workplace Accidents in Georgia …Contact us Now for a Free Consultation. 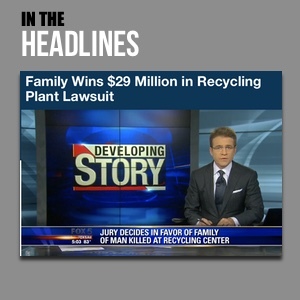 The Murray Law Firm has recovered millions of dollars for victims of unsafe workplaces in Georgia, and recently obtained a $29.25 million dollar verdict for one of our Clients in Fulton County State Court.